I looked at the lid of the box for a long time, and even took a picture to send to my sister on WhatsApp. She’s an expat, too, so I knew she would understand. What I was holding was a box of pizza. What I was feeling was a explosion of emotions: relief, elation, guilt, and grief. What came out were tears. We had just moved to Kunming a few weeks before. This was our first time living in a city with so many foreigners, so many amenities. Sure, we had lived in Nanning before, but that was back in the day, before MixC and Starbucks entered the picture. In the meantime, we had lived in Jingxi, a small town. A really small town. Definitely no pizza delivery there. And now, here we are where I can call up Papa John’s, if I wish. (In English, no less!) I can go to Starbucks. (I don’t. It’s expensive.) I can get multiple types of cheese. My Chinese neighbors drive luxury cars, and I’ve met several locals who spent the summer in Europe, New Zealand, or the U.S. for fun. Very few people stare at us, and no one yells “waiguoren!” I want to lean over with wide eyes and whisper to Bruce Willis “I see white people” because there are so many of them here. Culture shock was expected when we moved to China, and on subsequent returns to this country. Reverse culture shock was expected every time we went back to the U.S. But this is something…in between? The culture shock of a different China, vastly different from what we had experienced so far. Even though it’s still China, I’m faced with feelings closer to those that overwhelm me in American cereal aisles. “Just enjoy it!” I was advised when we moved here. “You deserve it!” others counseled. I was enjoying it (and couldn’t figure out how exactly I deserved it), but the enjoyment was mixed with so many other emotions that it was hard to untangle everything. The scene that has continued to come to mind is after Tom Hanks finally gets rescued in Cast Away . Remember the buffet, when he is just staring at the already-cooked crab? The audience immediately understands the irony. He is recalling how incredibly difficult it was to get crab when he was struggling to survive on the island, and how horrid it was for him to discover there is a vast difference between raw and cooked crab meat. And now the crab is right there on a platter for him, already caught and cooked, ready to eat. It’s not that he necessarily wants to go back to hunting crab with a stick and getting gashed by coral in the process, it’s just that he is feeling the weight of something that everyone around him is taking for granted. I’m slowly adjusting, as I always do. I am already used to being able to buy non-UHT milk, and I just assume that the bakery/cafe near us will have tortillas when I need them. At the same time, writing that sentence makes me feel spoiled. I’m still not quite used to two aisles of imported food at Carrefour for me to ooh and aah over, but I don’t gawk at it like I did just a few weeks ago. 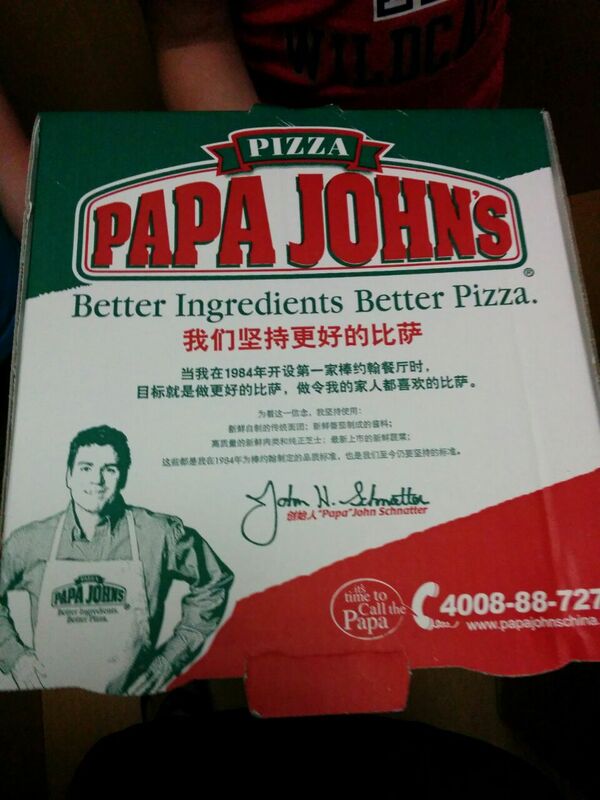 And then there’s Papa John’s. I ordered it three Mondays in a row after an American neighbor (we have an American neighbor?!?) told me that’s the day pizzas were half price. It was such a relief to have that option, especially as we were still unpacking our apartment. It wasn’t just a relief. I was elated to have options like this after so many years of living without. But there was also a weird kind of guilt, knowing that many of my friends and coworkers still lived in places where not even the most basic foreign food exists. And there was also the grief of facing the fact we were no longer in a rural area, which was a goal we had been so happy to finally reach. It was hard to have that changed. So, three Mondays in a row, I was hit with a bomb of mixed emotions. I think I teared up every single time. I think it will get less emotional to order pizza, though, as we continue to adjust to life in this big city. I’m guessing some day soon, I’ll order pizza again and it won’t make me want to cry anymore. I will have moved through this type of culture shock, whatever it may be, and adjusted to life in this new place. The theme at Velvet Ashes this week is “Adjust.” Here are more posts I’ve written about adjusting. “I wish there was just one big button to press. Activate China Mode! And it would be done. I would instantly fit in perfectly here.” Read post. “I feel more at home when I walk by tricycle carts and run-down mianbaoches than I do as I pass Porsches and BMWs.” Read post. “In short, we did what we have to do so very often here: we substituted, we improvised, we did the best we could with what we had.” Read post. Thank you, Jodie! Yes, so much more than pizza. I lived in small and medium sized Chinese cities (although not as small as where you’ve lived) and then went back to the U.S. for a few years. I came back to China, to Beijing. The first day I went to the neighborhood where my school is, I am pretty sure that I saw as many foreigners on the street as my whole year in my first city. Shock! And it is so easy to find foreign foods (although non-UHT milk is still eluding me, but I haven’t looked very hard). Shock! So your experience makes complete sense to me! I bet Beijing was a big change and a big shock, Ruth. So. Many. Foreigners. I’m surprised there’s not non-UHT milk, though. How in the world are we so blessed here? We’re not even second tier. Interesting to think about, thanks. I hear you! We’ve been living in a bigger city for a year and a half now after 5 years in a small town in Gansu….I am still floored by the pizza delivery, the milk on the corner that is fresh AND ALREADY PASTEURIZED, i can’t go to Carrefour without going to the import section even if I don’t need anything – just because it’s so much easier than carting it across the country, and all of the foreigners. I still have to bite my tongue and ladle on the grace (for me and for others) when I hear people talk about how hard it is to live here…because it CAN be hard in its own way, but it still feels like a Chinese version of the promised land to me! 🙂 What a gift it is to get to experience these things with delight! Enjoy! This post is so great. I’m late in commenting, but your words make me smile, laugh and tear up! We’ve also gone through small town (although not as small town as you!) to big city living in China. And yes, the shock! Being back in the States causes similar reactions. Funny story. Last night I was so excited to make Ashley Felder’s Cheddar Broccoli Soup. This was my first time to make it in the States with REAL, PRE-SHREDDED CHEDDAR CHEESE!!! I made it and the fam all dug in. (It’s a family fave) I was three-fourths of the way through eating my bowl before I realized that I FORGOT to put the cheese in!!! Thank you, Danielle! It seems like a lot of China people end up with similar experiences. Glad to know there are others in the same boat who can relate. Your cheese story is great! Anticipation, excitement, and then, DOH. Haha, Danielle. That’s awesome! 😉 Surely you stopped everyone and added it in immediately?! Great post! We’re adjusting the opposite way (sorta), though. We spent the past 2 years in Changchun, and although I hated the 6 months of ridiculously cold winter, I loved the size of the city, particularly where we lived–easy access to so much. Now, we’re 45 minutes outside of a city, but on a campus with 40K students. Surely with that many people, KFC would want to be here, right? Nope. So we salivate at the chance to go into town (hiring a black taxi) to get a taste of “Western” fare. (Isn’t it weird that we think these places taste good when we don’t even eat at them when we’re home!?) I just had KFC tonight since we trekked into town for fellowship. I devoured that chicken! Living out in the boonies has made me, like you said, appreciate at the times we do get to have a taste of home (without slaving over it in my kitchen). Thank you, Ashley. Yes, yes, yes. Nothing like living in a small town (we didn’t have KFC, either :)) to make you appreciate the big city wonders of, well, just about everything. I’m glad you are able to get into town at times. I think those trips are pretty important when you live in the boonies, and not just for the food. It’s good to have a break from the fish bowl every once in a while.